An industrial floor coating can transform the look of your work space and repair your concrete floors at the same time. 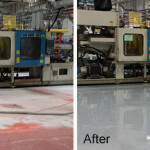 Whether you’re renovating your factory or building a new one from the ground up, industrial floor paint will provide the foundation you need to effectively work for years in the future. 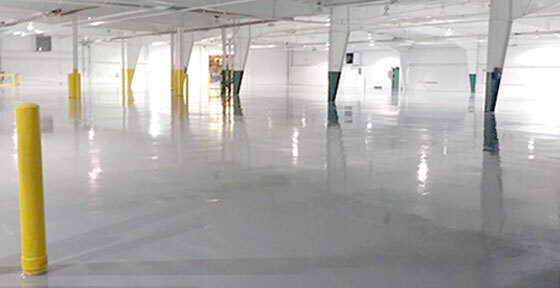 The industrial floor coatings we install at North American Coating Solutions are made to withstand years of heavy wear and tear. Invest in quality industrial floor coating now and save yourself money in the long run. Invest in professional industrial floor coating from North American Coating Solutions, and you will have a great looking floor that lasts for years. Our industrial floor installations come with a 5 year workmanship guarantee, so you can count on the reliability of your floor coating. Call (586) 226-9416 today to speak to one of our Industrial flooring contractors. Our self-leveling industrial floor coatings will fill in small cracks and other damage in your concrete, creating a smooth surface that makes your floor look brand new. We offer complete industrial flooring removal services to get rid of pre-existing epoxy floors, as well as concrete shot blasting to help the industrial grip your concrete better. In no time at all, you will have new floors to enjoy in your business thanks to our industrial floor coating solutions. Industrial floor coatings can be used in businesses, garages, manufacturing plants, showrooms, and more. They are incredibly versatile in their application, and they look great no matter where you put them. Our industrial floor installers work with businesses in Michigan, Ohio, and Indiana, and our garage flooring installers service homes throughout Metro Detroit. Contact us today to get your free quote for industrial floor coating, and we will gladly go over your options. Call (586) 226-9416 Now For Your FREE Industrial Floor Coatings Consultation!